Live plants are being added into cabinetry and even directly into the kitchen island. At this year’s LivingKitchen, a trade show in Cologne, Germany, numerous manufacturers showed off the latest worldwide kitchen trend: more greenery near cooking spaces. Living plants are appearing on the back or tops of kitchen islands and peninsula cabinets. They’re also appearing as wall shelving, which include grow lights to keep them thriving even when tucked away onto shelves. In one extreme example of the trend at the trade show, a dwarf citrus tree was growing in the middle of a kitchen island made by Italy’s Aran Cucine. It included its own irrigation system. For those who want to keep their plants more contained, they can opt for an under‑counter appliance that will grow, light, and water the plants for them. Manufacturers of one such product (the Urban Cultivator) say they’ve been selling the most units in coastal markets and high-end communities. "“"Plants in the kitchen can provide seasonings for food and fresh ingredients for salads, soups, entrees, and sides," Forbes.com writes about the trend. "Plants can also create a welcoming atmosphere for residents and guests alike." It's not just the kitchen that is seeing more plants. Plants are entering more master bathrooms to evoke an indoor-outdoor spa and appearing in more living spaces. The plant movement is gaining attention thanks to studies that increasingly show the benefits of having houseplants, which have been linked to purifying the air, boosting your mood, and even lowering the risk of illness. 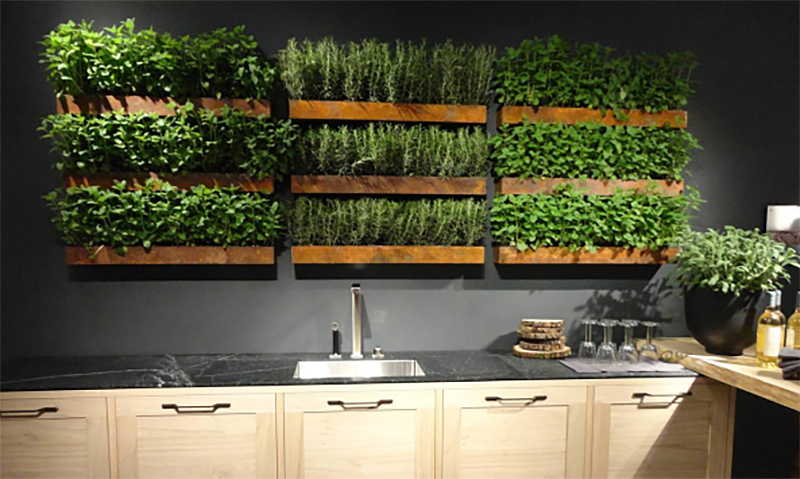 Homeowners are adding edible plants in the kitchen to use while cooking. Technology is helping in keeping plants alive less of a chore, too. Self&8209;watering containers are making plants easier to care for, and grow lights are helping them to thrive in even the darkest corners of a home. From an article featured in National Association of Realtors, Realtor® Magazine. Before you list your home for sale, call the John McClintock Team at 267‑759‑9518 for no obligation recommendations on timing, pricing and an overview of our comprehensive marketing package that includes, home staging, brokers' open house, virtual tour, video tour and social media sharing. Browse nearly 1,500 single family homes currently For Sale in Bucks County. Call us today at 267‑759‑9518 to arrange private tours. † Information is deemed reliable though not guaranteed.